Yes Yes , I know I have been irregular and the sudden disappearance is not appreciated . This post is only to let you all know I'm very much alive . Ofcourse when I say that I conveniently assume you'll care of my well being . My first cousin got married recently , so shaadi ka ghar kaisa hota hai aapko toh pata hi hoga . No ? Well more on that later . I also had Bcom exams and now I'm back to the hell hole I call " Office " very fondly. Nevertheless silent March is going to make up big time , Haveeee you met Awesome April :P ? So the basic idea is I put up an inspiration everyday for the entire month of April and you all can join me and blog with the help of that inspiration. The inspiration could be a song , a quote or a picture and you'll can use it to write a post or do something totally out of the box with it :D. By the end of the day I will update the post with my interpretation and links to your posts =) Cool idea right. Yeah Kanika's brain child. Also I haven't found 30 Inspirations yet so if you have anything inspiring to share do send it to me on blublubling@gmail.com . Credit will be duly given. 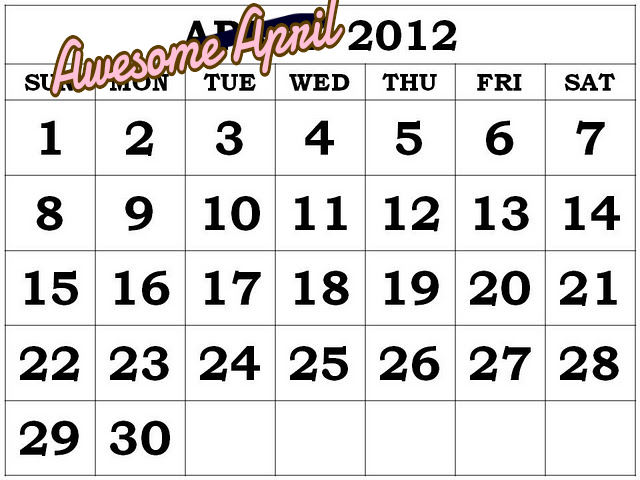 So watch this space for more of Awesome April and please please please join me so as to not make me look like a retard . Thank you . Interesting idea - could use a lot of ideas too .... am running ut of steam here! Something to look forward to while i'm in chennai then :D all the best! :* make me fall in love with awesome april!